Here's how to get stronger, kupo! 1. Level up your characters. Defeat enemies to gain levels! Unlike equipment, you can't combine characters to make them stronger. Instead, you have to defeat enemies to earn experience points (EXP) and gain levels! With each level a character gains, his or her stats go up too! If you find yourself in a dungeon you just can't complete, try heading back to an earlier dungeon you know you can handle, and complete it again to raise the level of your characters! 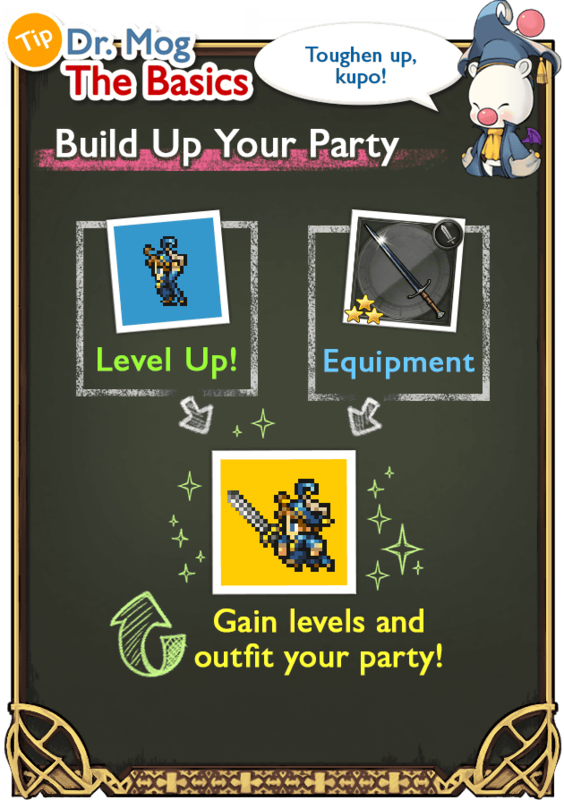 Some Power-Up Dungeons offer a bonus to EXP, so be sure to check the dungeon schedule if you're looking to level up! Collect equipment, then upgrade and combine it to make it even more powerful! When you defeat enemies, they have a chance to drop equipment upgrade materials, and sometimes even equipment itself! The Power-Up Dungeons can be a good place to stock up on upgrade materials, too. 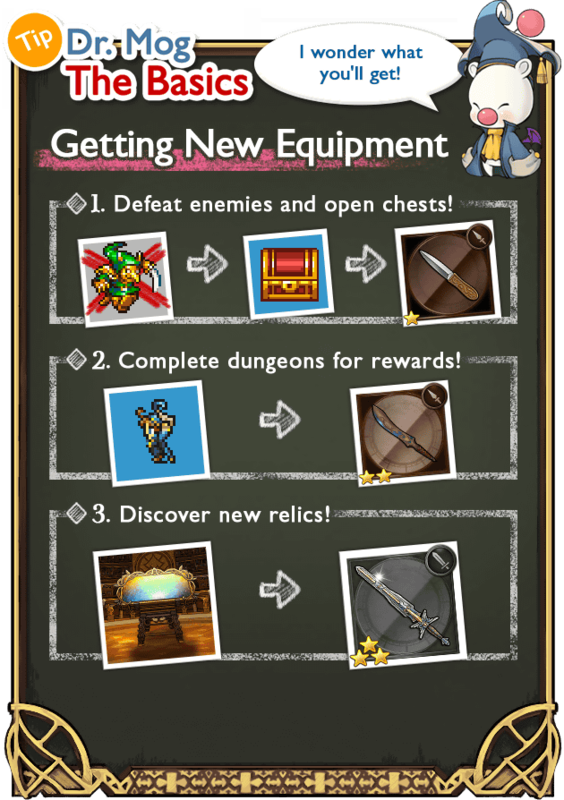 Some Power-Up Dungeons offer bonuses to equipment upgrade material drop rates, so be sure to check the dungeon schedule! You get 1 free Common Relic Draw per day. The free Common Relic Draw resets daily at 5:00 AM PST (1:00 PM UTC). Once you have equipment, the next step is upgrading it! 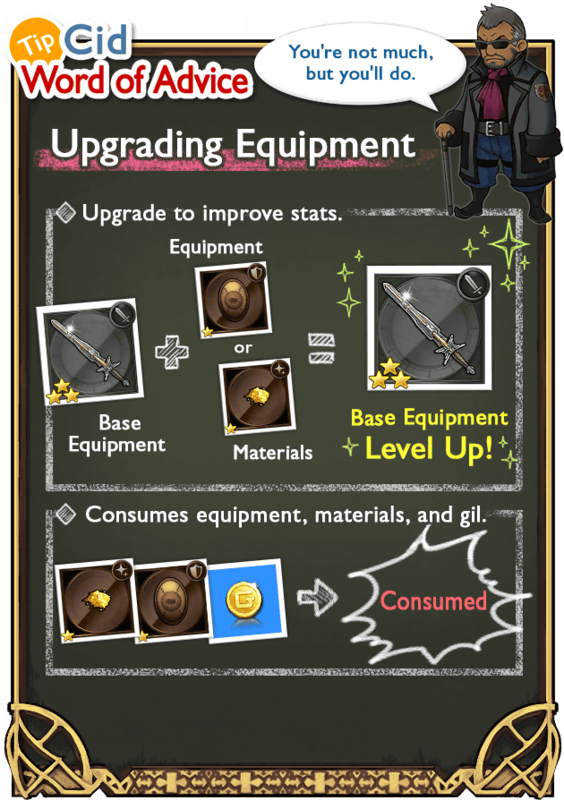 Combine unneeded equipment and use upgrade materials to raise the level of your equipment! Each piece of equipment has its own level cap, so keep this in mind when upgrading. If you don't have enough gil to upgrade, earn more in battle or sell off unwanted items. After upgrading your equipment to maximum level, it's time to combine it! 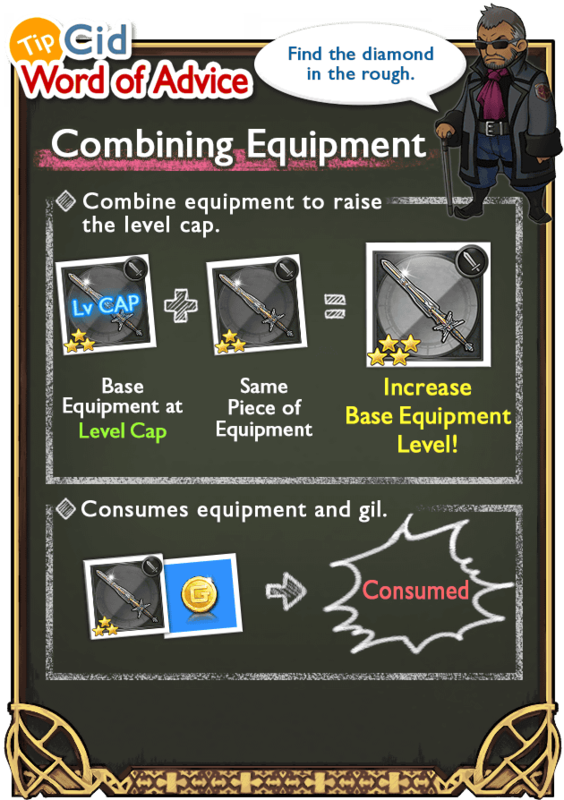 Combining equipment raises its level cap. Once the cap is raised, you can upgrade the equipment further, until you have a truly legendary weapon or piece of armor! *Accessories cannot be upgraded or combined. 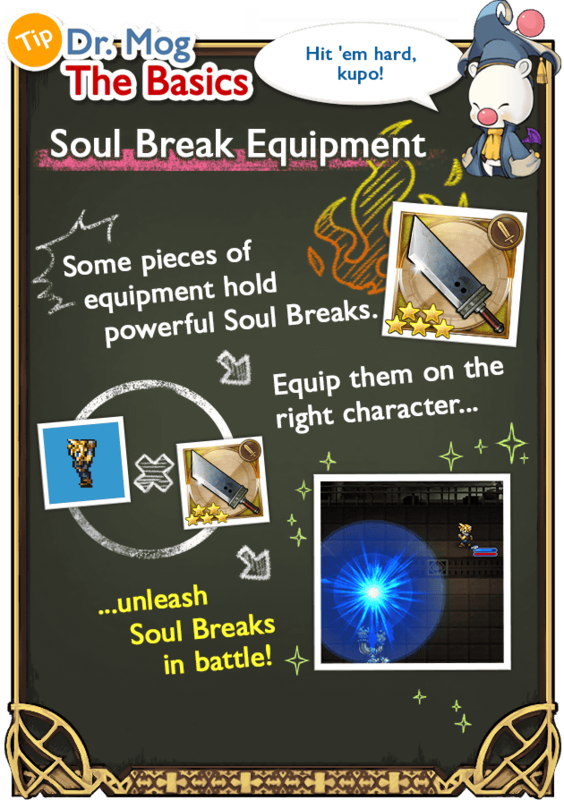 Some Rare pieces of equipment allow characters to use new Soul Breaks, but a character has to ready the equipment to use the Soul Break. If a character's equipment provides multiple Soul Breaks, you can go to the equipment screen to choose which to use before entering a dungeon. 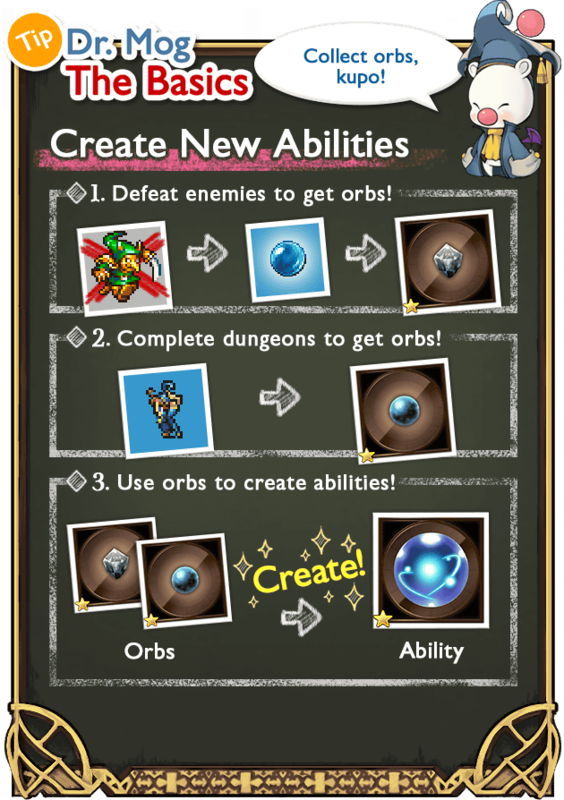 Collect Orbs, Create New Abilities! There are all kinds of abilities, from Fire and Cure to powerful summons. Bosses and enemies have different vulnerabilities, so give your party abilities that will be most effective against the foes you expect to face. The more abilities you make, the better you'll be able to handle whatever comes your way. *Note that not all characters can use all ability schools, or all rarities of a given school. 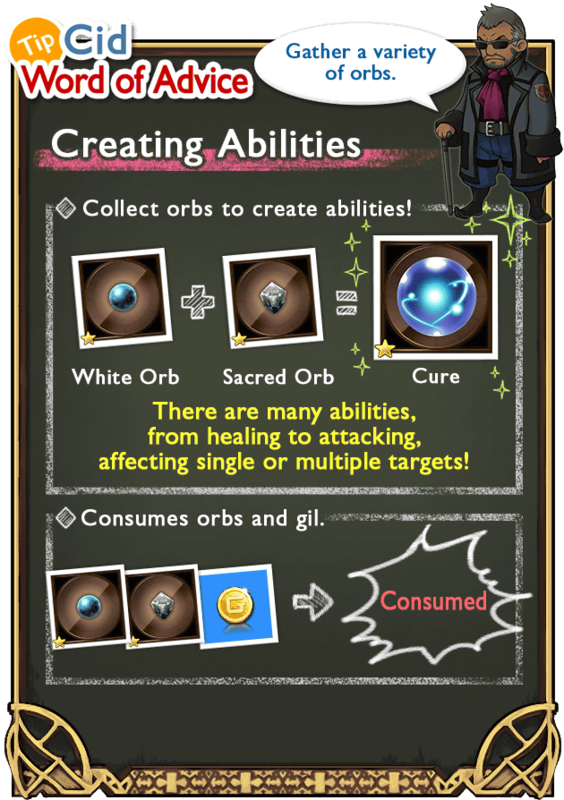 You need orbs to create abilities. First decide what ability you want to create, then start hunting for the orbs you need to create it. You can use the Power-Up Dungeons to make your search for orbs more effective. Below is a list of the Power-Up Dungeons and the bonuses each offers. If a dungeon has an item you're after, that's the one to go for. ＊ The drop rates for rewards depend on the difficulty selected. Honing abilities lets you use them more times without resting or leaving a dungeon! 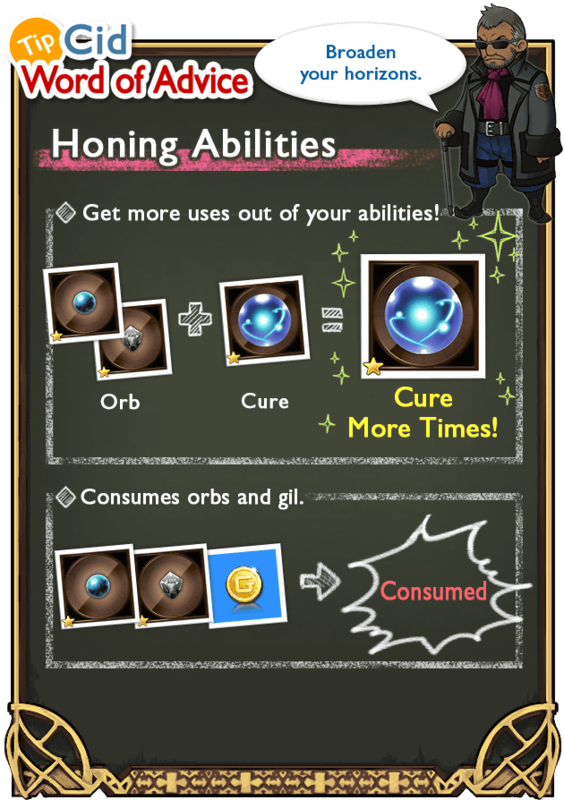 Check the honing recipe for the ability you want to improve, then gather the orbs you'll need! For more information, see Help or the FAQ.